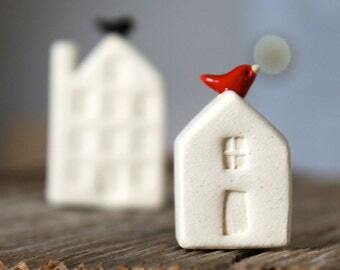 Announcement Handmade Small-Scale Pottery featuring tiny houses, birds, hedgehogs, foxes and more, in addition to Tasha's Line of Holiday Ornaments. For Wholesale Inquiries, please visit www.tashamckelvey.com. 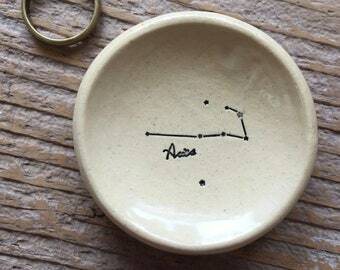 All items are handmade in Tasha's studio in Richmond, Virginia. Handmade Small-Scale Pottery featuring tiny houses, birds, hedgehogs, foxes and more, in addition to Tasha's Line of Holiday Ornaments. For Wholesale Inquiries, please visit www.tashamckelvey.com. 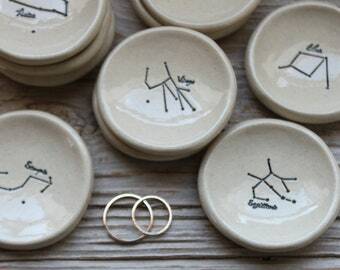 All items are handmade in Tasha's studio in Richmond, Virginia. Base is much broader/thicker than shown in the photos, so the bird is smaller than expected from a dimensional aspect. Still nice and the giftee liked it just not as expected for me. It’s too broad to be a ring holder. My apologies that the ring holder's wide base was not as expected. Customer feedback, a desire for my ring cones to be able to accommodate a wide variety of ring sizes, as well as additional stability (so the ring cone won't tip over easily) has led to the bottom of the hand-formed cones being widened slightly over time. While I definitely see it as a design improvement, I understand you expected the bird to visually appear larger (the bird size needs to remain small so rings will fit over it easily). As these are custom made, I'm always happy to make a ring cone to order for a particular ring size upon request for no extra charge. I will be updating photos of this item to better represent the average dimensions/ratios between the bird & cone. Thanks for your feedback! 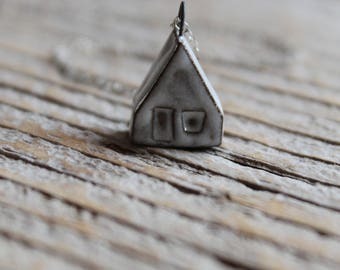 A few more tiny houses available in the shop now (with teensy birds). I started my pottery business during my senior year of college in 2000. My professional work went through several incarnations: from utilitarian kitchenware to sculptural ceramic boxes geared towards gallery settings. I opened an Etsy shop in early 2006. 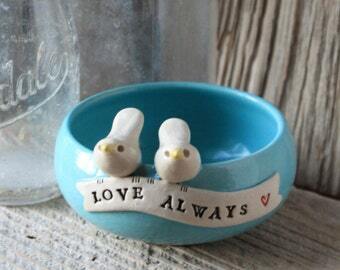 Soon after, selling online instead of primarily at Art & Craft Shows reshaped the type of ceramic work I was creating. 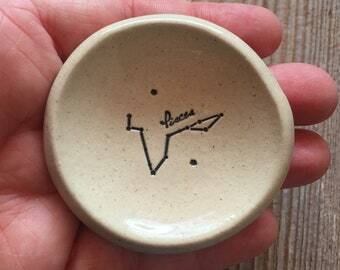 I started working on smaller, easier-to-ship pottery. 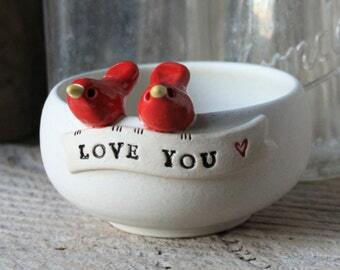 It wasn't long before I was making porcelain jewelry and my signature line of small-scale bird pottery. My current work is easier to market to wholesale customers, as well as online shoppers. My work is now sold across the globe. My clay work is intended to be useful - this is art that is meant to be touched. In the past everything we used in the home was made by hand. Today our homes are filled with stuff stamped out by machines. When we seek out handmade art we make our surroundings a little more human. 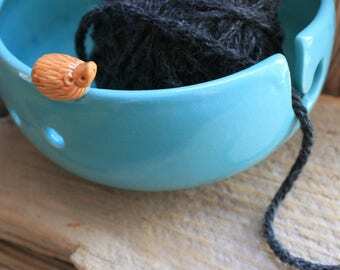 I throw on the potter's wheel or use slabs of clay to hand-build my clay forms - then I add that little something extra. 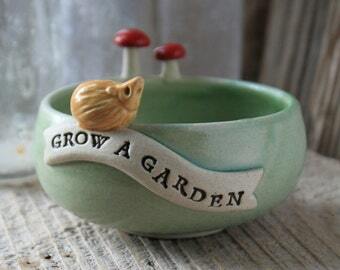 Right now I am making lots of pottery inspired by the gardens & forests of my childhood. I also have a complimentary line of handmade ceramic jewelry and Holiday ornaments. I’ve always been a maker. From a very young age I knew I wanted to be an artist. Drawing, painting, crafts & creative play were second nature for me - unlike most early school work due to my dyslexia. I was blessed with family and teachers who actively encouraged me to focus on my strengths, even while I struggled in other areas. My difficulty in school was great training for being a professional artist. Being an artist is labor of love that can be filled with challenges, yet the good definitely makes up for the bad. You just can’t give up. I believe in making sustainable choices for my business and my life. I’m always striving to decrease my business’s environmental impact - from moving my studio to my house and buying from local suppliers to cut down on fuel usage to hand recycling my clay. My gift packaging and shipping materials are made from recycled or re-purposed materials. Whenever possible I purchase re-purposed, recycled and/or recyclable supplies for my studio and office. My business is committed to continuing the promotion of handmade & sustainable business practices. Tasha McKelvey has a wholesale line of Handmade Small-scale Pottery & Holiday Ornaments - please visit www.tashamckelvey.com or contact Tasha via Etsy Conversation for more info or to place an order. Individual item's approximate dimensions are included in the product descriptions (in inches). Most items have a picture with the item listing that show the items' size (with a ruler, female's hand, average size female's ring, etc). Please scroll through the listing items to see the item's scale. Many items offered in Tasha McKelvey's Etsy Shop are custom orders - allowing the customer to choose the glaze colors, and for some items, personalized inscriptions. 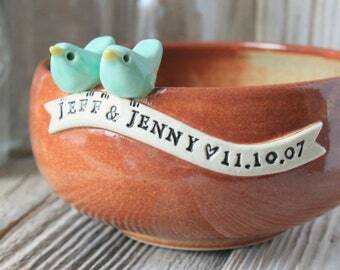 Unfortunately, due to the small size Tasha can not add inscriptions to the bottom of her small bowls. Due to many factors, including time constraints, Tasha McKelvey can not currently accommodate special orders designed by customers. 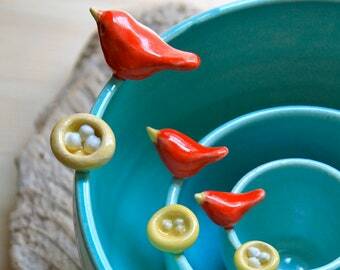 Tasha McKelvey's pottery is Food-Safe & Microwave-Safe. Items can cleaned in the dish-washer, but hand-washing is recommended to avoid the chance of another dish chipping or breaking a bird or other embellishment during the wash cycle.